JUST BECAUSE YOU DON'T SEE THEM...DOESN'T MEAN THEY AREN'T THERE! THIS IS AN EXCERPT FROM MY FUTURE BOOK CALLED: ALL THE WALL. 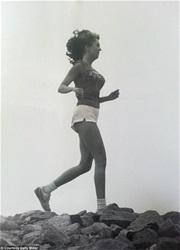 IN 1990, I BECAME THE FIRST WOMAN TO TRAVEL, ON FOOT, THE LENGTH OF THE GREAT WALL OF CHINA. 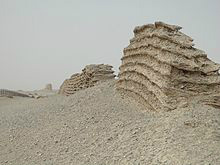 "Ten days ago, I began my Great Wall Adventure in Jiayuguan, at the wall's western end. For many reasons today was, for me, an extremely hot and difficult day. With the shadows of darkness overpowering my last glimpse of daylight, I knew it was time to shut-down. My body was tired; I felt so overheated I was actually shaking. Weeks ago, while training in Houston, I'd studied the aerial maps of the Great Wall--so generously provided by NASA-- but somehow, I’d overlooked the fact a large expanse of Wall crossed the Gobi Desert. For the past five days--- I’ve been overwhelmed with a constantly-glaring sun, unrelenting ankle-deep sand, and bombarded with dry, gritty winds. From the map, it looks like I should be out-of-the-desert by, hopefully, tomorrow afternoon. Tonight, I don't have enough energy to open my tent. Besides, with nothing but sand and high winds from all directions, I'm afraid I can't anchor the tent sufficiently. Why take a chance that my tent might “take flight” with me in it!?!?! “Unpacking” my body takes almost 15 minutes: I wear a runner’s backpack; then there are 15 small canvas bags of supplies hanging from a belt around my waist; plus multiple pairs of extra shoes--all looped together by shoelaces-- hanging around my neck. Consider, that, in addition to all the above, I carry a rolled tent in one hand and a sleeping bag—also packed inside a customized bag with handles-- in my other hand. Taking out a large polyurethane bag from my backpack, I carefully place my paraphernalia…including camera, sunglasses, and various medicines… inside, then fold it several times and tie it with an extra shoelace. It's important to keep the elements away from my equipment, necessities, and limited food supply. My compass, whistle, Swiss Army knife, and small flashlight hang on chains around my neck. These items never leave me, for any reason! Almost one hour ago, I treated myself to an energy bar and now... I'm eager to drink one of my thermos of water. Tomorrow I must find extra water. Only two 16 oz. Thermos fit in my backpack and I have very-limited space for extra water or anything else. Hurrying to unroll my sleeping bag, I must sit down. I'm too exhausted to care about being alone in the middle of a huge desert but, why would it matter, anyway? There aren't any trees, or grassy areas, even sand dunes to provide shelter. Besides, why would any wild animals or wacky humans choose a wasteland-like-this-one for late-night exploring?!?!?! Removing my tennis shoes, I tuck them inside my sleeping bag, close beside me...turn on my left side (my favorite sleeping position) and immediately forget it all. Suddenly,I'm alert and completely awake--- but why? Everything around me is black. I’ve never experienced such complete darkness and, for a few seconds, I'm reminded of past panic attacks... but then… I'm alerted to some activity around me. Although cocooned deep in my sleeping bag, I can definitely sense movement--and now....it feels like small “things” are running up, down, and across, my wrapped body! Oh, no! Something is caught in my hair…oh, damn, I must find my flashlight! This is so scary…. Struggling to unzip enough material to release one arm, I quickly locate my flashlight under my chin-- point it down the front of my sleeping bag--- and click. It’s difficult to describe the horror of what I see. My heartbeats are out-of-control as I watch millions of white, pink-eyed ( albino) mice-- jumping and running across my encased body!!! Months later I would learn that these rare mice are regular night travelers on the desert. Daylight blinds them so they can only move-around at night. Now, aiming my flashlight in every direction reveals the shocking truth: The Gobi Desert is alive with endless numbers of these stampeding white mice and, apparently--for thousands of miles in all directions-- I am the only human. Knowing this frightening nightmare will surely end with the morning light, I grab a scarf from my down vest, wrap my head, then tuck and bury myself down-deep in my sleeping bag. I pray for daylight to come quickly and vow this will, absolutely, be my last night in the desert." In the days to come, I will remember this particular night as the most frightening and most challenging night of my journey….UNTIL… the night I encounter The Black Leopard on The Great Wall. But, I’ll save that breathtaking-experience to share with you… next time.